Toronto Operetta Theatre mounted a highly enjoyable, all-Canadian production of Leonard Bernstein’s Candide (seen January 5, 2007), a work not staged professionally in Toronto since a Canadian Opera Company production in 1985. For this production director Guillermo Silva-Marin chose the 1999 Royal National Theatre version of the work featuring John Caird’s adaptation of Hugh Wheeler’s book (itself a replacement for Lillian Hellman’s original book) and a reduced orchestration for fourteen instruments. Under conductor Julian Wachner the TOT Orchestra gave a rapid but exhilarating account of the overture. Wachner so adroitly highlighted the abundant humour of parody and exaggeration in the score that Bernstein’s wit moved repeatedly moved the audience beyond smiles to laughter. Tenor James McLellan’s boyish good looks and fresh-faced innocence made him an ideal Candide. The richness of his voice and the emotional intensity he gave “It Must Be So” and “Nothing More Than This” lent the character and the opera the depth they must so crucially have. Soprano Carla Huhtanen gave a spectacular account of “Glitter and Be Gay,” with joyously secure top notes and beautifully precise runs, all the while acting out Cunegonde’s hilarious vacillation between conscience and materialism with aplomb. Best-known for her Carmen, Jean Stilwell was an atypically attractive “Old Lady.” The earnestness of her delivery of the Old Lady’s most outré tales only heightened their pitch-black humour while her radiant dark voice and vivacious performance made “I Am Easily Assimilated” a showstopper. 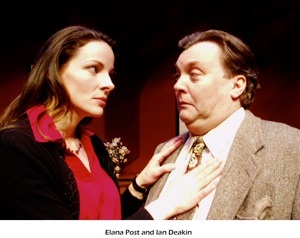 The prime disappointment was baritone Ian Funk, who proved neither vocally nor dramatically effective in the triple role of Voltaire, Pangloss, and Martin. The chorus sang with fervour and precision throughout. Unlike Robert Carsen’s recent Paris production, Silva-Marin did not update the work. Played on a bare stage overhung with flags and banners, the piece clearly became, through Mireille Vachon’s costume design, a journey toward self-realization through experience of the world’s excesses. The cast first appeared in simple whites and natural colours in styles cleverly blending the eighteenth century with the 1950s. As the action progressed all the characters except Candide changed into increasingly elaborate, more colourful costumes, culminating in the visually riotous Venice carnival scenes when Candide, untrue to his trusting nature, finally donned a mask and scarlet gown for his denunciation of Cunegonde. Then, in a masterstroke during the heart-catching finale “Make Our Garden Grow,” the cast one by one divested itself of masks and trumpery to face the world again in the simpler, humbler garb it first wore. Note: A version of this review appeared in Opera News March 2007. 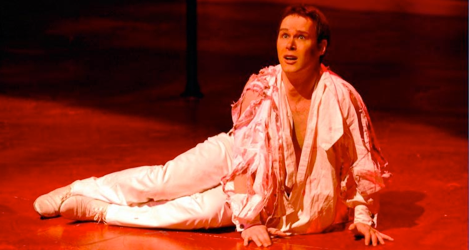 Photo: James McLennan as Candide; cast of Candide. ©Gary Beechey.